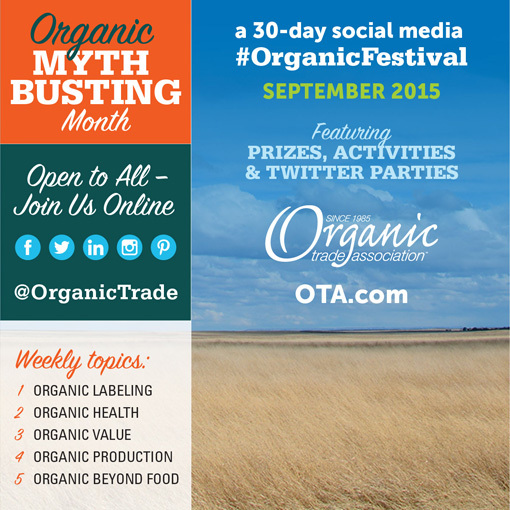 In a major drive to educate and inform consumers of the benefits and the facts about organic, the Organic Trade Association (OTA) and dozens of organic brands and industry thought leaders are uniting online Sept. 1-30 for “Organic Myth-Busting Month,” a 30-day #OrganicFestival on social media aimed at addressing long-held misconceptions surrounding organic. Whether busting myths that organic isn’t affordable or correcting the misconception that science can’t prove the organic benefit, OTA along with dozens of strategic partners will take to social channels each day during “Organic Month” to tear down organic myths by replacing them with research-supported facts, engaging dialogue and opportunities to get questions answered. The organic truths will be presented as well-designed graphics, ideal for sharing across social channels. Leveraging the #OrganicFestival hashtag, the massive social media gathering – expected to reach millions of consumers across Facebook, Twitter, Pinterest, Instagram and LinkedIn – will encourage individuals nationwide to help bust the myths and spread the facts by offering member prizes to people who engage by sharing myth-busting posts on their own channels. “Organic Myth-Busting Month” also will include at least five Twitter Parties, featuring industry thought leaders as co-hosts for hour-long Twitter chats to foster online, two-way conversations between top organic experts and consumers. In addition, OTA will hold activities at special September events, including Natural Products Expo East. Week #5 (Sept. 27-30): Organic Beyond Food, celebrating the lesser-known silos of organic, sharing why organic fiber, home and personal care products are better for your skin and health, revealing the differences between organic and conventional textile production. Prior to the campaign’s Sept. 1 launch, OTA will provide members and influencers with all campaign materials, including scheduled posts, graphics and other content, to share throughout their networks to amplify the messages. OTA successfully introduced this strategy in September 2014 with its first social media festival: “Organic-Palooza,” a 10-day campaign aimed at celebrating organic food and fiber, which garnered 109 million consumer impressions and featured 100 members taking part. Contact Kelly Taveras, OTA's Digital Communications Manager to learn more.